Gone are the days of throwing on your boring khaki parka or plain black coat every day, "just beacuse it's warm" - this season is all about the coloured coat. 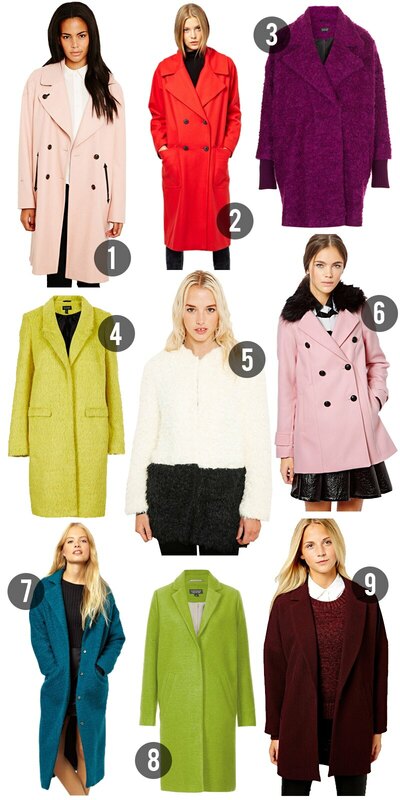 Double breasted, boyfriend and maxi coats are everywhere right now in a rainbow of eye-catching colours. This is very exciting for a coat hoarder like me! I think i'd die if I had to wear the same coat everyday throughout Autumn/Winter. I usually end up wearing a different one every day to mach each outfit - I love coats THAT much. If its not as warm as you'd like, layer up with thermals, chunky knit jumpers, fur stoles, wooly scarves, mittens, thick tights and you're good to go. Love that pink River Island number. Great price too! I love 5 and 9! In need of number 1 ASAP! The colour of Number 9!! I need to go on the hunt for this! OMG number 3 ive seen in topshop and its oh so beautiful! I really need a new winter coat. As if my favourite is the cheapest for once! They are all amazing though! WIN A FASHION WEEK TRIP & $1000 TO SPEND!